Top referrers shows you all search terms which brought traffic to your site, ranked in order of popularity, for any given period of time. Popularity is defined in terms of the most visits generated at the top. The list can be sorted by search term, or search engine. See screenshots below for details. One interesting feature is the ability to expand a search term and see how many visitors were sent for a sepcific search term from each search engine. 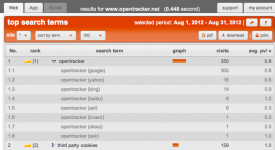 So for “opentracker” we see traffic from: google, yahoo, bing, baidu, aol, kvasir, alexa, and ask. Use the calendar to select your date range. The columns displayed, from left to right, are: No., Rank, Search Term, Graph, Visits, Avg. pv/ v.
Avg. pv/ v. means average page views per visit. This is a method of measuring Traffic Quality; in many cases, the better quality the traffic, the more time they will spend on your site. For example if you are trying to decide between purchasing traffic from two separate sources, and one source delivers traffic which looks at 1-2 pageviews on average, and another looks at 5-7 pages, then there is a clear differentiation. The Rank column shows you if popularity has changed over time, using green and red arrows. 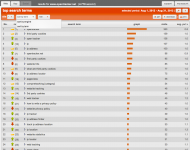 A list of the all search terms used to find your website ordered by the number of visits generated by each search term. The report is available for any selected date range. Compare search term per referrer Expand any search term entry in order to see individual referrals per search term (see Drill-down per referrer screenshot below).